, written by Jolinda Hackett. The book came out this past year and has more than 300 recipes, covering from breakfast to dessert to even ice cream. I flipped through the book last night while trying to find a dinner idea – with 45 minutes until eating time. 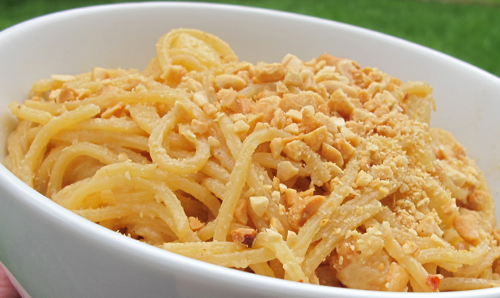 I came across Sweet and Spicy Peanut Noodles on page 158 and decided to give it a try. I did a couple changes so that I could make it with what I had on hand. I really liked it but Kirk was middle of the road, mostly due to the texture of the pineapple. I happen to love cooked pineapple, him not so much. Oops! If I were to make it again I would add some sweet chili sauce to the sauce so it had more of a kick. 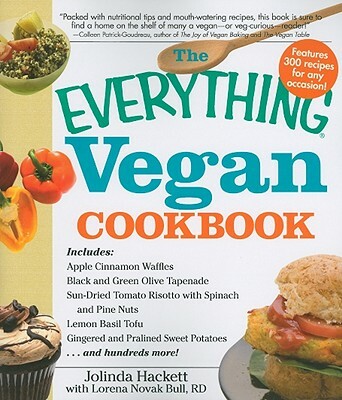 The book though is a great starting point for anyone considering more vegan meals. It is approachable and easy to use! Drain the pineapple into a small mixing bowl, reserving the juice. Press on the pineapple to remove more of the liquid and then finely chop up. Bring a large pot of water to a boil, cook the spaghetti for shorter time on package and drain. (Mine was 5-6 minutes, I did 5). Meanwhile in a small saucepan over medium-low heat the reserved juice, peanut butter, soy sauce, garlic and ginger. Heat the olive and sesame oils in a large skillet over medium-high. Add in the pineapple and pepper flakes, cooking till golden brown, shaking often. Add in the cooked noodles and start shaking/stirring for another minute till the noodles are starting to sizzle. Whisk the sauce and then pour over. Using tongs start tossing until the sauce thickens and coats the noodles. 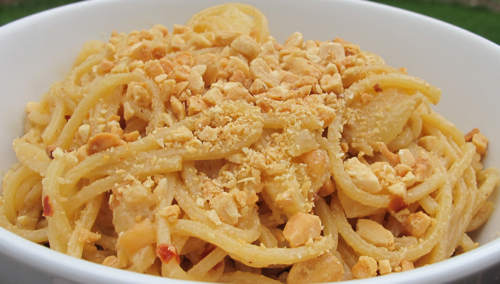 Take off the heat, dish up in bowls and top with peanuts. Next Post Double Peanut Butter Cupcakes – Only For Those Who LOVE PB!